Spigots are frequently used to center, i.e., to make the axes of two, either workholding devices and/or workpieces, coincide. A spigot is simply a piece of round metal. Often one end is one diameter but the other end can be a different diameter. But both diameters must be concentric relative to each other. It is always assumed to be accurately round and free of any dings though not necessarily hardened. Usually accuracy is improved if both ends of the spigot are as long as practical, for example, once to twice the diameter of this end of the spigot. The opposite of a spigot is the bush. A bush is simple round part with a hole in it. The size of hole need not be the same at both ends of the bush. Two spigots, each of the same diameter, can be centered by fitting them into the opposite ends of the same bush. Alternatively a bush can be fitted to a spigot to change its diameter. In this situation is is perhaps better seen as being a sleeve. It is easy to see that any hole that can take a spigot becomes a spigot. Any round part that can be fitted to one end of a bush becomes a hole. Worse than this a spigot with a hole in it can be seen as a bush. A bush with an outside concentric to its bore becomes a spigot. What this means is that any round part or hole can usually be centered with any other round part or hole by means of a spigot or bush or spigot and bush combination. Usually the limit is when the diameter of the spigot becomes too large, about 50mm diameter. Spigot and bushes are ideal for use with smallish holes or round parts. There are easier ways of aligning or centering larger parts, for example, the DTI on an arm device. For any spigot or bush to fit each other always means there is some play between them. Each time another component is added the potential play increases. For small spigots the simplest solution is to use material that has been ground to a standard size. It is also possible to use the shanks of some types of cutters such as long series endmills. All holes that are made to take spigots should be reamed. In every case all diameters on a spigot must be concentric. In general, any system using spigots/bushes should use the minimum number needed to achieve the required centering. This might seem too simple to be worth mentioning. But, in practice, it is not always as easy as one might expect. Consider a rotary table with a spigot in its center hole. This spigot has a hole in it that is meant to fit a spigot fitted to the spindle. If the rotary table is clamped to the milling table then the centering depends on turning handles etc. It is not easy. It is far easier to let the rotary table “float” and let it move till the spigot fits the hole “naturally”. The milling table is then moved till it is possible to bolt the rotary table to the milling table without using any force at all. Though the obvious way to line two spigots up is to use a bush there are times when it is possible to line them up by testing to see if their axes are coplanar. This is much easier if the diameters of both spigots are the same. The test is to use a small, straight edge such as one side of a small square. This is fitted against the edges of the two spigots in both the x and y directions. The total number of spigots needed is less if some spigots have holes in them that can themselves take smaller spigots. This will only work properly if the fit of the spigots one in another is really good. Spigots are used not only to center a workpiece or a device but they can also be part of the method of clamping them. For this purpose a spigot may have a hole though it or even a thread either of which can be used for clamping. If a spigot has a thread in it then, clearly, it cannot be used to take another spigot. But it is possible to have a hole at one end and a thread in the other end. Consequently it is often worth fitting any spigot made with a hole into which other spigots can be made to fit. This hole can also be used to put clamping bolts through. If there is a milling chucks to spare it is quite useful to keep it permanently fitted with a spigot. 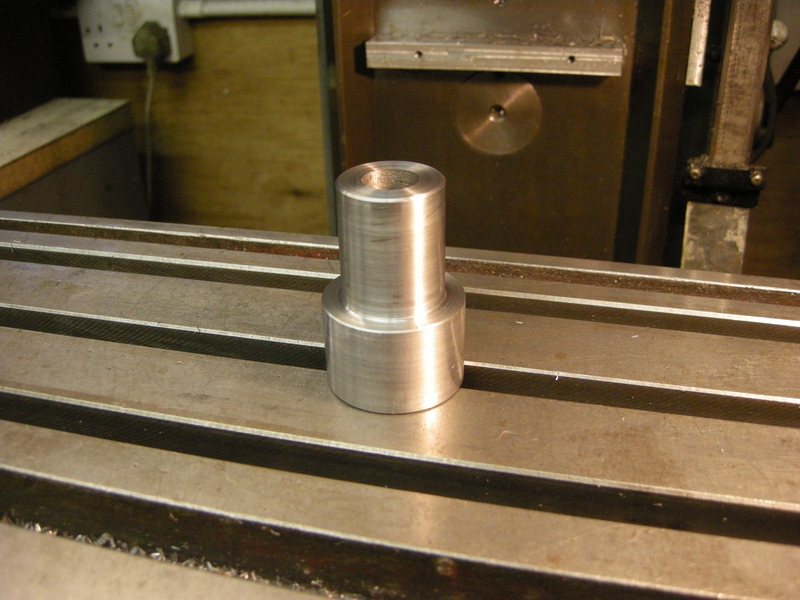 Milling chucks, if bought second-hand, are not necessarily as accurate as they might have been when new. It is worth checking any milling chuck/spigot pair for accuracy. It might be possible to find one pair that is better than another. It is more important that a spigot frequently used for aligning is accurate than one used for holding a milling cutter. A plain spigot will not fit an Autolock type chuck. With an Autolock chuck a spigot has to have a thread on one end of it. An easy way to make one like this is to use long series threaded endmill from which all the cutting parts have been cut off. This can be done with a grinding disc. When a plane surface needs to have this surface centered with the center of a hole it is useful to have a spigot that fits this hole at one end and where half of the other end is milled away – accurately. If a spigot is to be the same diameter both ends it is very easy to make it from ground rod of the required diameter. Silver steel always has a ground finish. Usually the harder the material the spigot is made of the better. It is possible to use commercially made dowels as spigots if a spigot with the same diameter from end to end is needed. If a spigot is to have a hole in it then the hole has not only to be the right size but it must also be concentric with the outside of the spigot. One way of doing this is to turn the outside of the spigot and then drill and ream without moving it in the chuck. The squareness of the ends and the finish of the ends is not critical. The sort of fit required for a spigot to be useful often means that they are difficult to get in and/or out of a hole. There are several ways of making this easier. A when you have finished turning the spigot to the right size polish its surface with very fine abrasive paper. B cut chamfers on the ends. D If the spigot does not have a hole in it, put a thread in it so a screw can be inserted into it to pull it out of a hole. E If a spigot has a hole in it, it can often be pulled out by using a short piece of coat hanger wire with a small hook at the end of it. The number of such spigots that might be useful can be surprisingly large. One spigot can look very much like another and very similar to many other bits of round metal. Where spigot are specially made to fit a particular device it is useful to keep it in a small box that is kept with this device and marked as being for this device. It is useful to have a box just for storing any other spigots in. The number of spigots will be smaller if, as far as practical, the spigots are made to standard sizes. Clearly there will be fewer if they are all metric or imperial but this is difficult if the workshop is “metric” since so many drawings and old machines are in imperial measures. If one allows for the fact that a round workpiece can actually be treated as being a spigot itself then there are often two factors that determine how spigots are used. Are the spigots the same diameter? Are the spigots in line or at an angle to each other? An example of the use of a spigot is where it is used to center a chuck on a rotary table. An example of where a spigot/bush used with a spigot is where a rotary table is centered with the spindle.